What does the plight of George R.R. Martin tell us about Frank Ocean’s? On Friday, August 5, four years of fevered anticipation will come to a head. According to the New York Times, that’s the day Frank Ocean will finally drop Boys Don’t Cry, his first release since 2012’s Channel Orange made him one of our most trusted, astute observers of love and class. And when (if? when? if?! when??!) the new album drop actually happens, it’ll bring to an end a very strange time in Frank’s life. His absence has stoked the obsessiveness of his fans: these days, any proof of his mere presence in public is a cause for celebration. The absence has also — incrementally, with each veiled Tumblr post and each tease gone unfulfilled — slowly driven them insane. Add it all up, and you get a strange, frothing anger. Underneath the jokes there is an underlying vibe that that feels off — the notion that it’s OK to be mad at Frank for this. Which makes it feel necessary to say something very obvious. How long should Frank Ocean wait before putting out new music? As long as he likes. 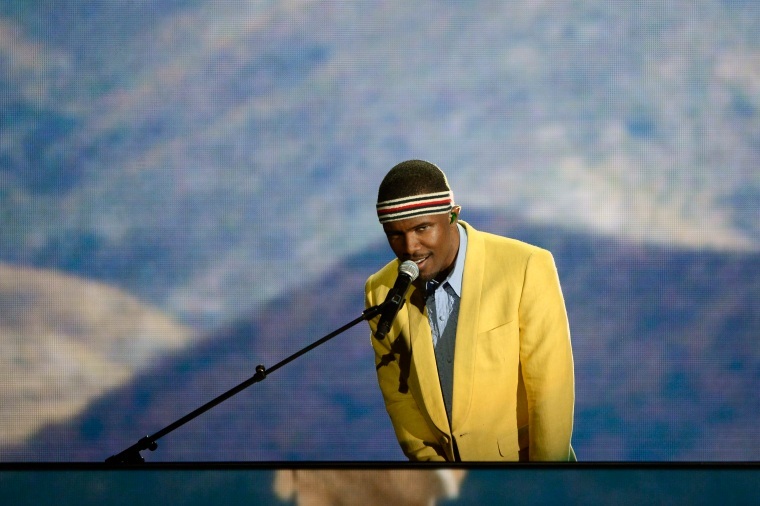 In taking his time, Frank Ocean is in good company: cultural touchstones as disparate as Donna Tartt and Terrence Malick and D’Angelo have gone much longer than he has (decades, in fact) between new material. They, too left fans wanting through their droughts. But the particular tenor of Frank Ocean’s fans’ online rage sets his experience apart. If the Tarrt-Heads were indeed gathering somewhere on the internet to shake metaphorical clenched-fists pre-Goldfinch drop, I personally cannot tell you where. Which means the artist with which Frank Ocean may have the most in common here is a plump, bearded, 67-year-old author named George R.R. Martin. The nice fellow who gave us Game of Thrones. In April, 2011 — right before GoT, which is an adaptation of Martin’s fantasy series A Song of Ice and Fire, premiered on HBO — Laura Miller profiled Martin in The New Yorker. She produced one of the best pieces you’ll ever read about the warping nature of extreme fandom. Long before TV made him regular-person famous, Martin had already built a massive fan base out of the kind of readers traditionally drawn to hard sci-fi and cultish fantasy — that is to say, the fervent ones. And for years, through enthusiast conventions and his cheery personal blog, he’d happily engaged with them. Then he decided the trilogy he’d originally envisioned wasn’t going to be enough. And then it stalled out. The first three books had been published in a span of four years, between 1996 and 2000. In 2006, the fourth one came; in 2011, the fifth. Two more are planned, with no publication date in sight. And at some point, as the chasm between release dates yawned larger, a small splinter group of Ice and Fire readers boisterously turned on their idol. That’s a reference to the writer Robert Jordan, who passed away in 2007 before completing his own sprawling fantasy series, Wheel of Time. It’s an insane thing, really: fans being this callous toward the death of the subject of their fandom. It’s like in their thirst to get the end, they completely forget it was Martin who gifted them the beginning. There are notable cases of artists waiting so long to release their long-rumored product that the whole thing wilts under the pressure. By the time Axl Rose let go of Chinese Democracy in 2008 — fifteen years after Guns N’ Roses’ last album, and last bits of relevancy — it had long since become a punchline. When Dre finally put out a new project, 2015’s Compton, he had to first scrap Detox: with all those years of anticipation, it had become too mythical to exist. Frank Ocean, if all goes to the reported plan, is going to stop testing our patience on Friday. But say he, again, fakes us out — say he makes us wait some more. Does a fan’s anger ever feel more palatable, more justified, more understandable? Is there a moratorium on patience? A few days ago, I emailed with Elio M. García, a Thrones superfan so well-versed that Martin himself consults him as a continuity cop. Garcia had never heard of Frank Ocean, he explained, but as a careful observer of Martin, he readily cottoned to the singer’s situation. At heart, this sort of obsessive-compulsive desire for a work of art — a book in GRRM's case, an album in Ocean's — is simply an example of egotism. It's taking someone else's creative work and framing it in terms of what it does for you first and foremost, as if that should be the artist's chief concern. The lesser variant — demands for "updates" with the implication that they just want to know progress is happening — are demanding a level of insight that a couple of decades ago simply would not have existed for many fans of artists around world. The Internet has made this kind of entitlement depressingly acceptable. In 1991, My Bloody Valentine put out their second album, Loveless, a shoegaze landmark that was famously fussed over. Recording was only done at night; a week at a time would be dedicated to recording two beats of a tambourine. Twelve years later, long after many fans had given up hope of ever hearing from them again, they came back with the remarkable m b v.